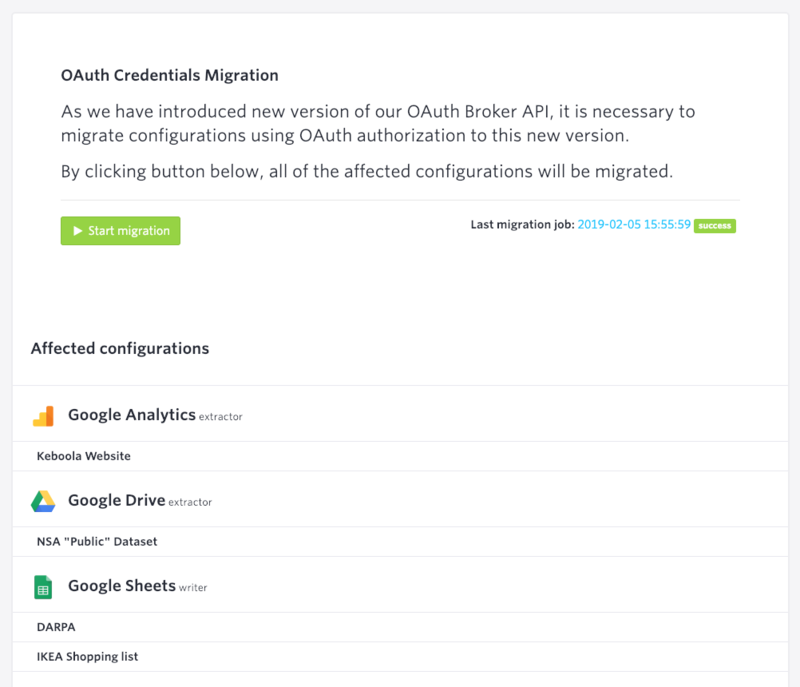 We have just released a new version of our OAuth Broker API. OAuth Broker is a KBC service, which handles the authorisation flow for all KBC components (extractors, writers, ...) using OAuth authorisation and also stores the credentials (tokens) for them. The new version was needed to simplify integration with KBC and allows us to implement new features into this API more easily. The features we are preparing are for example automatic refreshing of OAuth tokens if needed, using more than one OAuth client id for better quota limits handling and so on. The old OAuth Broker is now deprecated, and we ask you to migrate affected configurations credentials before May 1, 2019. We can't migrate these credentials automatically because we cannot modify configurations in your project without your consent. Some of the components - GitHub Extractor, Twitter Ads Extractor and ZOHO CRM Writer - need to be reauthorised manually in order to be migrated to the new version. New configurations are created with the new version of OAuth API from now. Also, if you reset the authorisation of existing configuration, it will be created with the new version. Miroslav Čillík upvoted this post.